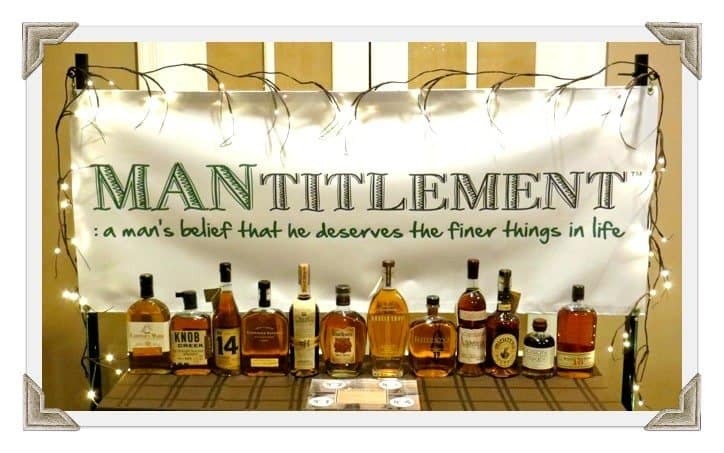 I know it the Super Bowl was on Sunday, but the highlight of the weekend for me was the Mantitlement™ Bourbon Tasting Party! 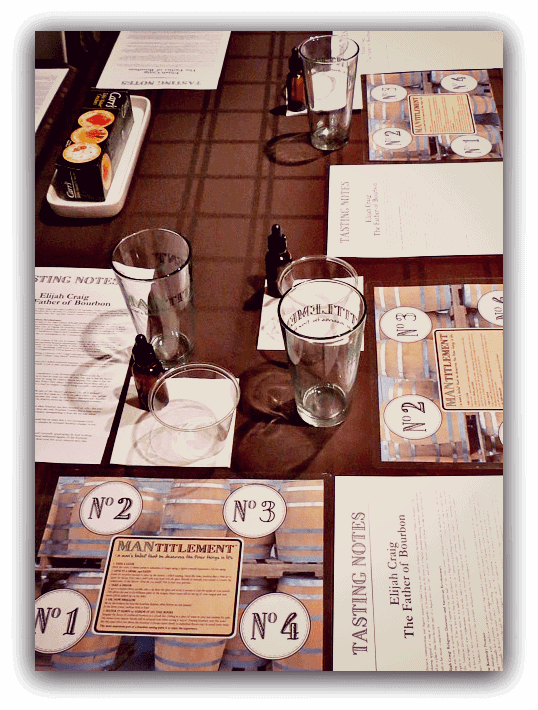 but I wanted it to be as true to a Bourbon Tasting as I could make it. I ended up with 12 bottles of Bourbon/Whiskey to use in the tasting. I divided them into three flights, pairing them with appetizers, dinner and dessert. I made my Bacon and Pork Meatballs, and a crazy-good Shredded Ham recipe for sliders that has quickly become a favorite recipe of ours. I was also lucky enough to have Chris from Cooking in my Yard bring his awesome pulled pork. Nice picture, too. And then I threw together this Bourbon-infused fruit cocktail. 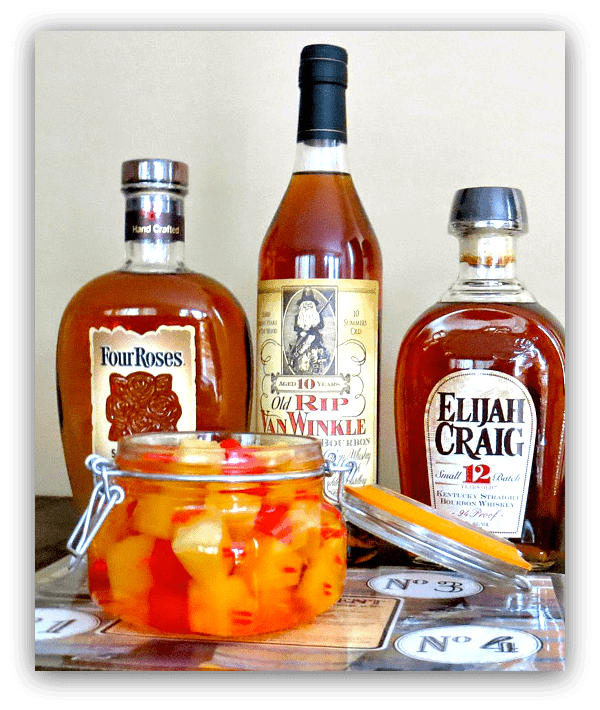 I used the Elijah Craig in here, skewered some fruit and threw it in a jar to marinate. Because why not have more Bourbon? So everyone got a dropper bottle filled with water. And there was also a “cheat sheet” that was provided with the tasting notes of each of the Bourbon/Whiskeys that were being sampled. I think I thought of everything. Angel’s Envy seemed to be the overall favorite of the night and the Bourbon that was guessed most correctly out of all 12. 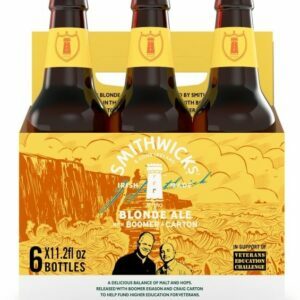 The notes seemed to be more distinctive and had a nice, smooth finish. To the winner of the tasting, I gave away a bottle of Elijah Craig. 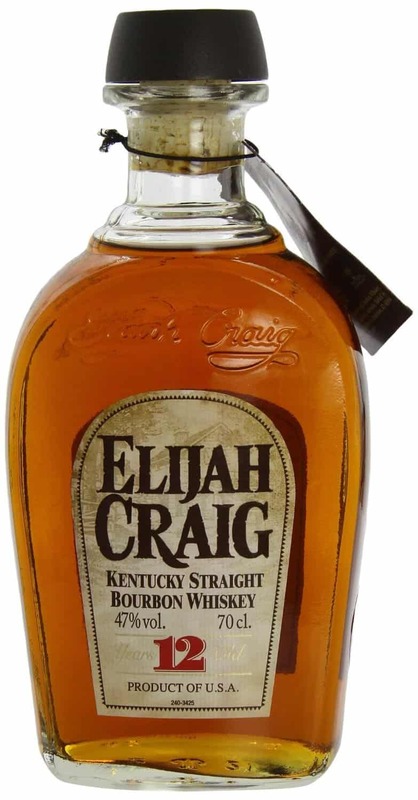 Elijah Craig Bourbon is said to be considered the “Father of Bourbon”. I displayed a story about Elijah Craig’s life to give a little background as to why I chose it. Here’s a link to the story, it’s pretty interesting. The night was overall a success- and I think a lot of fun too. I feel very lucky to have a great group of friends and family that would come and participate in this Bourbon Tasting with me. I know there were a few of you that couldn’t make it, so I hope we can all keep up this tradition and do it again soon…maybe next time we can kick it up a notch with a Tequila Tasting?? Any volunteers for hosting the next one…please leave a comment below! Sounds great! Tell Chuck I’m putting him down! Yes, I think that’s fair. Colin…? I agree with that. Colin, when are you hosting the next party? Thanks Chris! 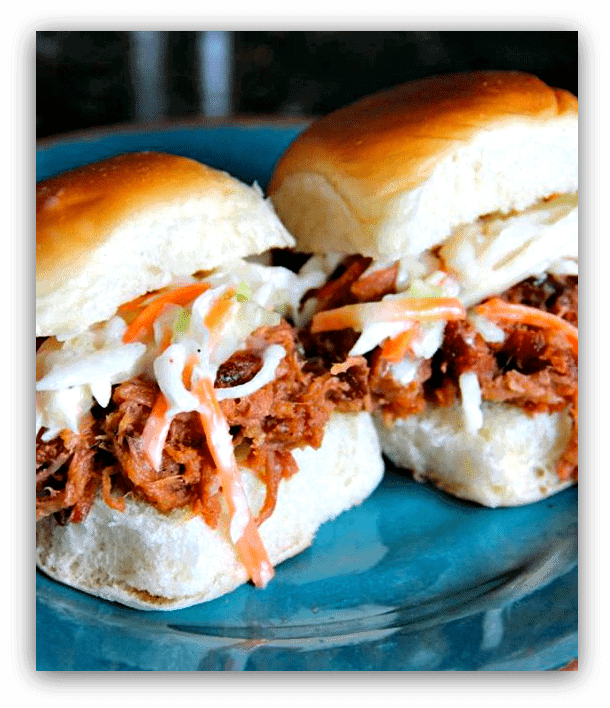 Thanks for bringing the pulled pork and coleslaw- they were amazing! Sounds like a well planned and executed event. Would it be improper to ask for a list of what you served? I was able to identify some by sight, but not all. Megan-of course I can give you a list of the bourbons, thank you for reading the post about the bourbon party. I will email you and give you all the information that you need. Okay, so here’s the question – I’m trying to figure out a bottle of bourbon to buy my husband for his birthday. Shelly linked me to this post a while ago, and I’ve had it bookmarked. 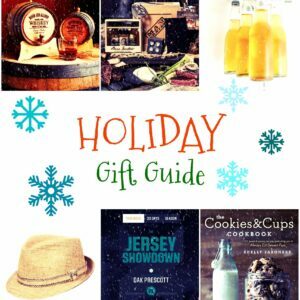 Of the Angel’s Envy or Elijah Craig, which would make the better gift? My husband loves a sipping bourbon, but he’s also just as likely to mix it with a homemade ginger simple syrup and soda, leaving me lost on what to choose. Hi Amber- The overall favorite at my bourbon tasting party was Angel’s Envy. The bottle goes for about $50, so it’s not cheap but also not the most expensive bourbon out there. A lot of the guys at the party, even non-bourbon lovers said they would buy this out of them all. So if your husband wants a sipping bourbon that he could also mix once in a while I think this is the one. Thanks for taking time to stop by the site! This is an excellent idea, and Im glad to see you pulled yours off so successfully. Make sure we get an invite at Bourbon of the Day for your next tasting! Thank you for the wonderful article! Would there be a chance that I could also get the name of the options that you served? Of course, email me and I’ll send you back a list. I’m also getting a small article together with printables of the place mats and the cheat sheets so check back in the next couple weeks for that! Love this! Any chance you still have the template you made for the mats? Chrystine, I think I do – are you having a party? I am indeed, a surprise Birthday for my husband- part of it is a bourbon tasting. Any chance I could get the documents from yah? Hi Dan-Just wanted to check, did you receive my email? 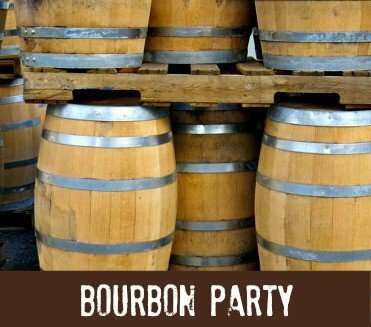 Your Bourbon party has inspired and I am finally having a tasting party in a couple weeks. I have ten great bourbons lined up. Can you please do me a favor and send me your placemat template and tasting notes. Also, if you have any recipes that would recommend that would be great. We doing the pulled pork and the bourbon bacon chocolate cookies. Would love to get the placemat template! 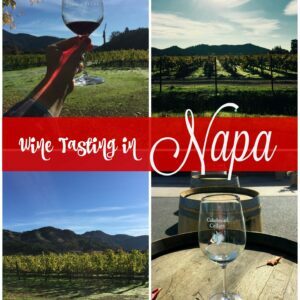 Planning for my hubby a birthday tasting next Friday! We live in Dubai so we don’t have access to as many great bourbons as you, but we did have some good finds that we are hoping to showcase! Is there a follow up post with the recipes you used? Kristen, send me an email and I’ll reply back with the placemats. If you click on the name of the recipes that you’re looking for the link will take you to the recipe. Let me know if I can help you with anything else! Thanks, hopefully I sent it to the right address! Joshua, I realize that I didn’t get this out to you, did you have your party already? Shoot me a quick email and I’ll email them to you ASAP if you haven’t yet! Sorry about that! Can I get a copy of your placemat template…it sounds super!